3. Siddha Asana or Vajra Asana. Where to chant: Mantras should be chanted in a quiet place. Once a place has been chosen, it should become permanent for all practical purposes. Best time: The best time for chanting mantras is the Brahmamahurta ( 4 a.m.). Other good times are the transition periods i.e. when night is turning into day ( dawn and sunrise), when day is turning into night (twilight and sunset). You can also choose the time before going to bed. Having chosen your time, you should be regular about the hours and duration of your chanting. Preferably, your rosary should not be visible to others when you are using it. Covering your hand with a cloth or a specially made covering is a common practice. With the rosary hanging over the middle, ring and index finger of the right hand, the thumb and middle finger are generally used to roll the beads. You must not cross the ' head' of the rosary when rolling the beads and must revert to the head after completing a rosary. How often: The number of times a mantra has to be chanted is usually specified. Normally, it is considered auspicious to chant a mantra 11 times, or 108 times or in multiples of 108. Once you have fixed upon the number, you can increase it but cannot decrease it. Mantra: AUM PANCAHVAKTRAYE VIDMAHE MAHADEVAYE DHI-MAHI TAN NO RUDRA PRACHODAYAT Translation: We contemplate on Mahadeva, may Rudra deirect our minds. 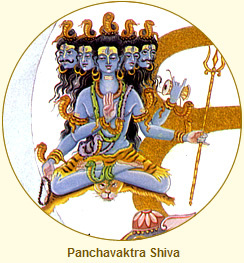 The presiding deighty of Visshudi Chakra is Panchavaktra Shiva. He has a camphor-blue skin and five heads, representing the spectrum of smell, taste, sight, touch and sound, as well as the union of all five elements in their purest forms. He holds a mala (rosary), a drum which drones continually, manifesting the sound AUM, and a trident. The fourth hand is in Abhaya mudra, the gesture of dispelling fear. 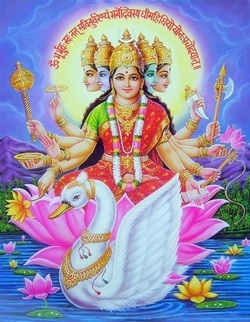 "Asitagirisamam(were the mountain) syat(ink) kaijalam(ocean) sindhupatre (inkpot) Surataruvarasakha(longest branch) lekhani(write) patramurvi(pen); Likhati yadi grihitva Sarada sarvakalam Tadapi tava gunanamisa param na yati." which means: "Oh Lord, if the blue mountian be the ink, the ocean the ink-pot, the biggest branch of the heavenly tree be the pen, the earth the writing leaf and taking these if Sarada, the goddess of learning, writes for eternity, even then the limit of Your virtues will not be reached." Reciting the aforesaid verse, Sri Ramakrishna entered into an ecstatic mood and cried out again and again, "O Great God, how can I express your great glory?" All came running towards that spot hearing the cries of Thakur. Mathur Babu was in the temple at that time. Hearing the uproar, he also came and prevented others from removing Sri Ramakrishna forcibly from the Siva temple. Mathur had already formed a high opinion about Sri Ramakrishna by that time. When Thakur came down to normal consciousness and saw the crowd, he asked Mathur whether he had done anything wrong. Mathur saluted him and said, "No, Ba Ba (father), you were reciting a hymn: I stood here lest some one should disturb you unthinkingly." Thus Mathur Babu protected and served Thakur in all possible ways for fourteen years like Nandi who eternally serves Lord Siva. Truly Mathur Babu and Hriday were to Sri Ramakrishna, what Nandi and Bhringi are to Siva. 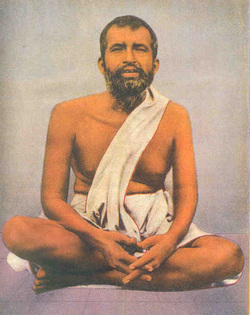 At another time, Mathur Babu actually saw Sri Ramakrishna as Siva and Kali alternately, as Thakur was pacing up and down. 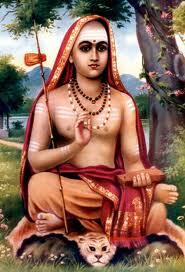 Shri adi shankaracharya's famous Nirvana Shatakam! Chidananda rupah shivoham shivoham . I am not attached to any righteousness) or sin; I have neither pleasure nor sorrow; I have no need for any Mantra; I have no need for pilgrimages ; I have no need for any sacred scriptures; Nor will I perform any sacred rituals; I am neither the subject nor the object nor the doer; I am a fortunate, joyful, supreme being as the emblem of truth, knowledge and eternal bliss. I am the self spiritual joy of pure consciousness Shiva, Shivoham, Shivoham.